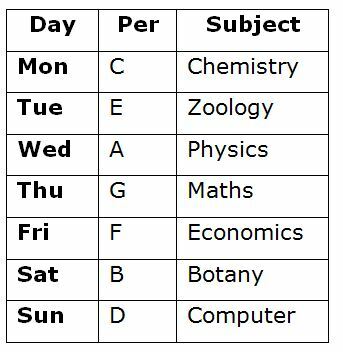 Seven students A, B, C, D, E, F and G are attending the exams on different subjects in a same week starts from Monday to Sunday. 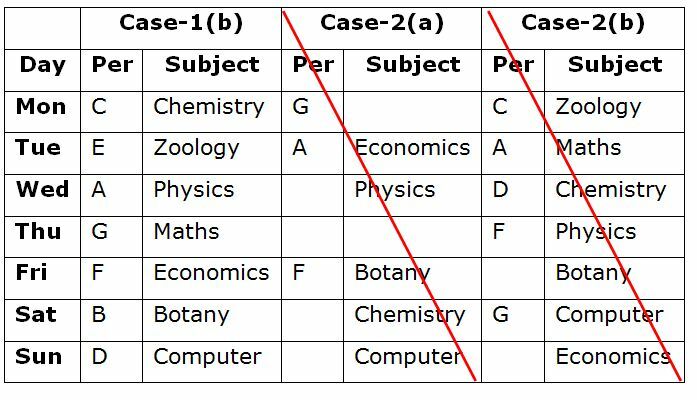 They all attend the exams on the subjects namely Physics, Chemistry, Maths, Botany, Zoology, Computer and Economics but not necessary in the same order. Only one person attends the exam on one subject in one day. 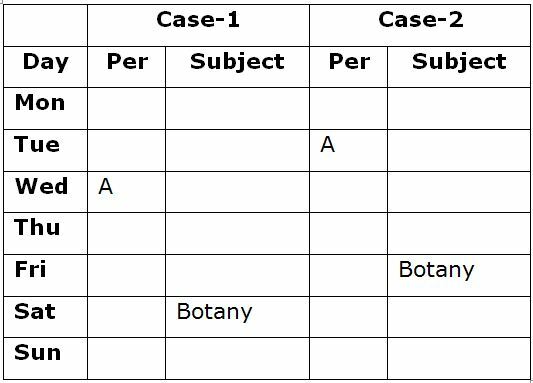 Two persons attend the exam between the one who attend the Botany exam and A, who attends one of the days before Thursday but not on the Monday. Three persons attend the exam between the one who attend the Chemistry exam and the one who attend the Economics exam. G attends the exam immediately before the one who attends the Economics exam. A does not attend either Chemistry or Computer exam. Only one person attends the exam between F and the one who attends the Computer exam, who attends after F. As many persons attend the exams before the one who attends the Physics exam is same as after F. As many persons attend the exam between C and the one who attends the Maths is same as between D and the one who attends the Maths exam. C attends the exam before D and does not attend the Zoology exam. E does not attend the Botany exam. 1. G attends which of the following exams? Two persons attend the exam between the one who attend the Botany exam and A, who attends one of the days before Thursday but not on the Monday. Three persons attend the exam between the one who attend the Chemistry exam and the one who attend the Economics exam. G attends the exam immediately before the one who attends the Economics exam. A does not attend either Chemistry exam or Computer exam. Only one person attends the exam between F and the one who attends the Computer exam, who attends after F. As many persons attend the exams before the one who attends the Physics exam is same as after F.
As many persons attend the exam between C and the one who attends the Maths is same as between D and the one who attends the Maths exam. C attends the exam before D and does not attend the Zoology exam. E does not attend the Botany exam. 2. How many persons attend the exam between B and the one who attends the Zoology exam? 3. If A is related to Chemistry and D is related to Economics in a certain way. Then, B is related to which of the following? 4. Who among the following attends the exam on Saturday? 1) G attends which of the following exams? 2) How many persons attend the exam between B and the one who attends the Zoology exam? 3) If A is related to Chemistry and D is related to Economics in a certain way. Then, B is related to which of the following? 4) Who among the following attends the exam on Saturday? 6) Statements: J≥K=L; K≤Q; B<D=N≥Q. 7) Statements: N≥P>K≥T; V<X; V≤W<T=R. 8) Statements: N≥T≥I; V≥J≤L; I<Z≥X≥V. 9) Statements: P≤F=E≥M; S>A≥E; G≤L≤M. 10) Statements: S>A≥E; G≤L≤M; P≤F=E≥M.